Rockin’ Ramen Noodles with Chicken are the. perfect. 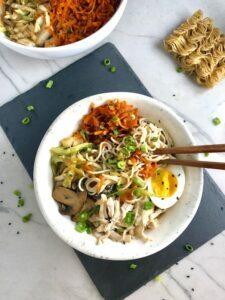 dish…tons of noodles, flavorful broth, chunks of hearty chicken, crunchy veggies, creamy soft boiled egg, sesame seeds and scallions to give a fresh bite. The broth is super flavorful with scallions, garlic, ginger, sesame oil, soy sauce, and chicken broth. Is your mouth watering yet? 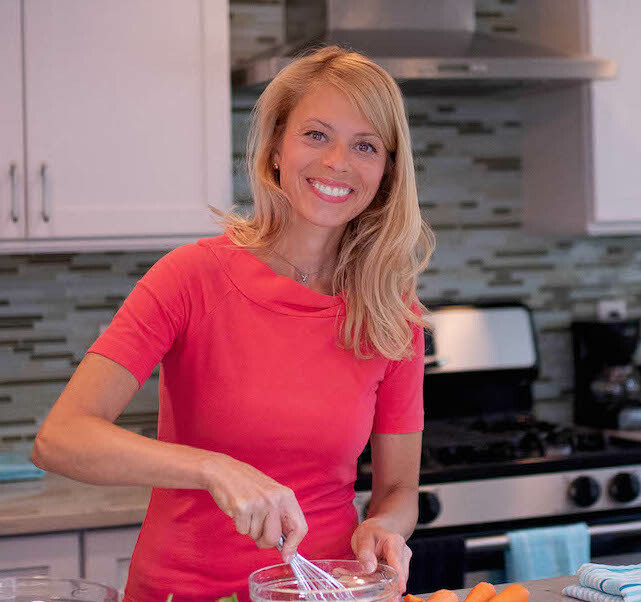 Why is this recipe Rockin’? Well, if all of that wasn’t enough, they are also Gluten-Free! Rockin’! 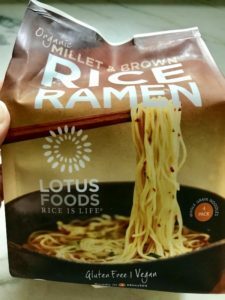 I found these gluten-free Ramen Noodles at Fresh Direct but use whatever brand you can find at your local store. BTW, if you are crazy busy like I am, I highly recommend delivered groceries. Fresh Direct has saved me for over 10 years! I no longer have to spend hours at the store wishing I was with my family! To check it out, click the offer here: Exclusive Offer For New Members! Save $25 On Your First TWO Orders Of $99 Or More When You Use Code FD25OFF at FreshDirect.com! 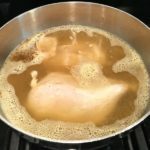 Make the Chicken and Chicken Broth base. Cool and shred the chicken, then add back to the broth and store in a storage container. 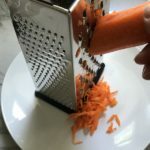 Shred the carrots and place in storage bag. 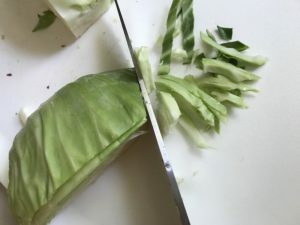 Thinly slice the cabbage and place in storage bag. 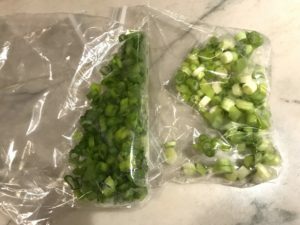 Thinly slice the scallions, separating whites from greens and place in storage bag. 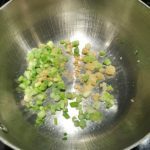 Mince the Garlic and Ginger and place half in with scallion whites and half in with cabbage. 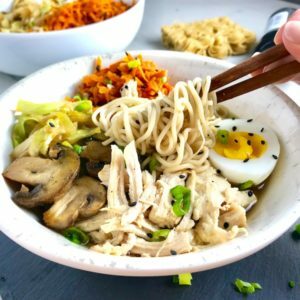 Place the broth with chicken, shredded carrots, sliced cabbage, scallions separated, plus the pre-sliced mushrooms, 3-4 eggs, black sesame seeds, bottles of sesame oil and soy sauce all on a sheet pan or in a large bowl to keep together as your RAMEN NOODLE with CHICKEN KIT! On the night you are ready to cook, pull your KIT out from the fridge! First, you will finish your broth with Chicken by adding scallion, ginger, garlic, soy sauce, and sesame oil. Boil the eggs to your desired yolk consistency, 5-7 minutes..
Sear and cook the cabbage with the ginger, garlic, Soy sauce and sesame oil. Then, Put it all together: Noodles, add broth, top with chicken, cabbage, carrots, mushrooms, half an egg, sprinkle of sesame seeds and scallion greens. Rockin' Ramen Noodles with Chicken are THE. PERFECT. DISH...tons of noodles, flavorful broth, chunks of hearty chicken, crunchy veggies, creamy soft boiled egg, sesame seeds and scallions to give a fresh bite. The broth is super flavorful with scallions, garlic, ginger, sesame oil, soy sauce, and chicken broth. Is your mouth watering yet? Why is this recipe Rockin'? Well, if all of that wasn't enough, they are also Gluten-Free! Rockin'! Chicken and Broth: Into a Medium pot, add the water, Bouillon or Base, Soy sauce, ground pepper. Bring to a boil. Then add in 2 Chicken breasts and push down to ensure they are completely covered. Bring back to a soft boil and cook for 10 minutes or until cooked through to 165 degrees internal temp. Turn off heat. 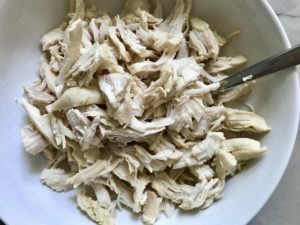 Remove chicken and let cool - enough to be able to shred the meat. You can let it cool overnight and shred it later. 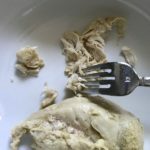 Once the chicken is cooled, shred it into bite-size pieces with fingers or a fork. Add the chicken back to the broth and place the chicken and broth in a storage container and store in the fridge. 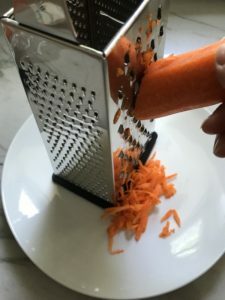 While the chicken is cooking, shred the carrots on the large side of a grater. 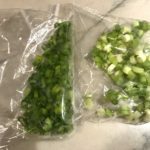 Place in a baggie for storage in the fridge. Thinly slice the cabbage and put into a storage baggie. Mince 1 Clove garlic and 1 tsp fresh ginger and add both the garlic and ginger to the cabbage. 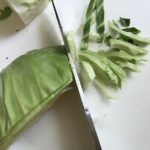 Thinly slice the 4 scallions, separating the whites and the greens. Place in baggies to store in the fridge. Mince 2 Cloves of garlic and place half in the baggie with the Scallion WHITES and half in the baggie with the cabbage. Mince 3 tsp of ginger and place half in the baggie with the Scallion WHITES and half in the baggie with the cabbage. Store your Meal 'Kit' on a sheet pan or in a large bowl: the broth with chicken, shredded carrots, sliced cabbage, and scallions separated. Also add the bottles of sesame oil, soy sauce, and sesame seeds so they are ready to go! When you are ready to cook your meal, take your 'kit' out of the fridge. Preheat the oven to 300 degrees F and spray a large sheet pan with Coconut oil. As you make each component in the pan, you will add it to the sheet pan and keep warm in the oven until ready to plate. Soup: To a preheated pot, add the coconut oil, scallion whites, ginger, and garlic. Stir and saute for 1-2 minutes, making sure it doesn't burn. Add the broth with the Chicken and simmer for 10 minutes. Eggs: Fill a medium pot with water and bring to a boil over medium-high heat. Reduce heat to a simmer and then carefully lower eggs into water one at a time using a slotted spoon. Cook 5-7 minutes, with 5 leaving yolk runny and 7 being firm. Transfer eggs to a bowl of cold water and chill while you prepare the rest of the meal. 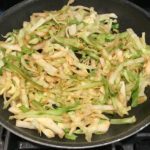 Cabbage: To a pre-heated large skillet or wok, add 1 tsp coconut oil or spray the bottom of the pan with spray oil. Then add the sliced cabbage with ginger and garlic, plus sesame oil and soy sauce. Stir to combine and let the cabbage sear. After 2 minutes, stir again and let cook for 4 minutes until just starting to wilt, but still crunchy. Transfer the cabbage to the sheet pan and put in the oven to keep warm. To the same hot pan, add the shredded carrots, soy sauce and sesame seeds. Saute for 4-5 minutes until seared and slightly soft. Transfer the carrots to the sheet pan in the oven to keep warm. Add the mushrooms to the hot pan with a pinch of salt and fresh ground pepper to sear them, adding a little coconut oil if needed. Cook for 5 minutes stirring so that seared on both sides. Transfer the mushrooms to the sheet pan in the oven to keep warm. Ramen Noodles: Last, to the same pot used for the eggs, now boil more water and cook the ramen noodles according to package instructions. Drain and then get ready to assemble! 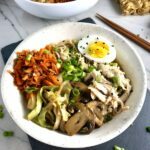 Assemble your Rockin' Ramen Bowls: Add Noodles to the bottom of the bowls, then add broth with with chicken. Next, top with cabbage, carrots, mushrooms, half an egg, sprinkle of sesame seeds and scallion greens. ENJOY!